It was with reluctance that I took on Ultra Swank’s assignment of a segment on Googie design. I am not an expert. Art historians and critics can be a vicious group. One false move and I could be forever condemned to an underworld of Louis the XIV basement rec. rooms accented with a million velvet Elvis paintings! Oh well, maybe they’ve got some Pepsi in the fridge? Googie is a sub-style suburban overpass of the great and mighty ‘Modern’ design and architecture highway. 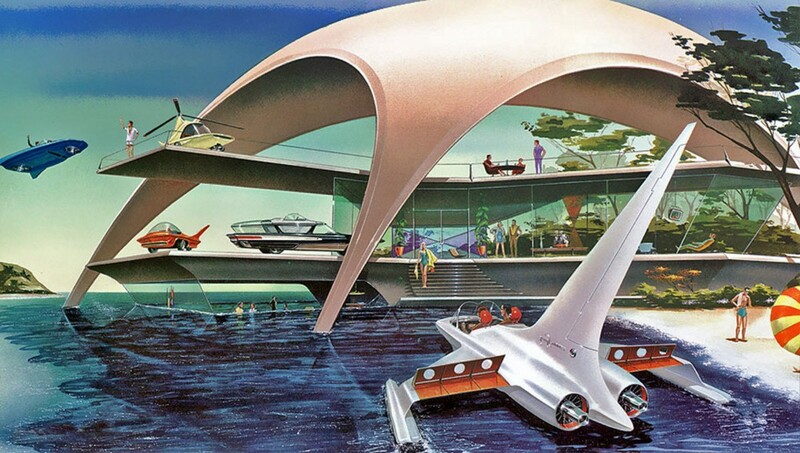 Simply stated – Googie is ‘Space-Age’ and George Jetson lived in a completely Googie world. The term comes from 1949 and a cute Los Angeles wife whose nickname was… you guessed it, Googie! (the style of which we speak is sometimes called ‘Doo-Wop’, but that’s not a good nickname for your wife). This nice lady’s husband commissioned, soon to be famous, architect John Lautner to design a coffee shop which he named in her honor (the coffee shop was torn down in the 1980’s — we aren’t sure about the nice lady). The Googie style owes a lot to it’s humble roadside beginnings. As suburbia sprawled so did the need of business owners to catch the attention of all those George Jetsons zooming by in their turbolite hydramatics. Enter Googie with it’s wild, colorful eye-catching fantasies! The style borrowed back and forth from car design and TV. It is architecture as advertising design as consumer fantasy. It is characterized by flowing lines and odd abstract cutouts and shapes. Boomerangs, atoms, parabolas and swiss-cheesey room dividers to name a few. Lava lamps are pure Googie but a little late too the party. Googie is the brave new child of weird devices, substances and thoughts. The beatnik kid of architecture, the Rod Serling of design! Dig it, daddy-o? The offices and dry cleaners of Googie appeared like flying saucers just landed at the north end of the shopping center. The miracle of post-war plastics allowed Googie to undulate and ooze. Restaurants looked exactly like a bakelite ashtray sitting on your masonite free form coffee table. The mean bullies of the architectural school called it ‘blob’ design. If The Modern Movement had it’s start in the Tutonic grimness of German disciple it’s best encore was in the blinking satellite drive-ins of Southern California. True to it’s coffee shop start. Googie is perhaps best exalted in it’s fantastic roadside signs. Contrived purely to dazzle the eye, these are the masterpieces of the unrestrained, exuberant fancy of Googie The future is still always just around the corner – perhaps we too, someday, will live in a Googie World.